ITU-T G.168-2012 (and earlier versions) outlines details pertaining to LEC/NEC testing methodology, including the device-under-test (DUT) setup and test signals, as well as specifications for all LEC/NEC tests, starting with Test No. 2 (with Test No. 1 incorporated into Test No. 2) through Test No. 16. The majority of tests are considered as mandatory for LEC/NEC (Test No. 2 through Nos. 7, 9, 10, 12, and 14); some tests – Tests No. 8, 13, 15 and 16 – are optional. One test, Test No. 11 is only left “for further study”. Some of the mandatory tests can be considered as non-applicable (for example, Test No.8), if the specified use cases or test conditions are outside of the target application. However, in such a case the DUT compliance is conditional and with a disclaimer note highlighting non-applicable test cases. Figure 1: Functional diagram for echo canceller performance evaluation setup. Echo path simulator (dashed line box) uses G.168-2012 echo path models as defined in the standard. The system setup for LEC/NEC G.168-complaince testing is shown in Figure 1. 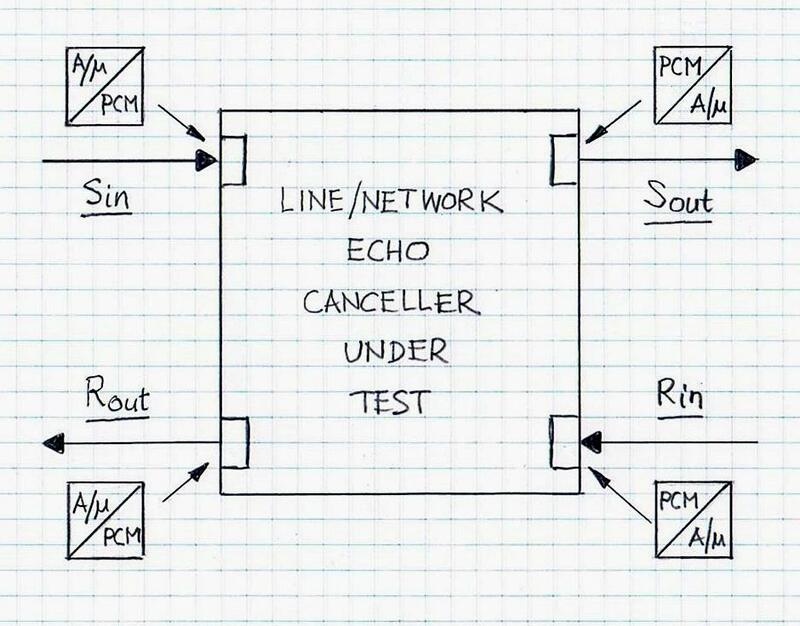 It is assumed there that DUT (i.e., LEC/NEC under test) is a stand-alone device equipped with line/network interfaces and control interface. Therefore, the respective interfaces PCM-A/m and A/m-PCM on the DUT side are within the LEC/NEC-under-test block (and they are not shown explicitly in Figure 1). These interfaces are illustrated in Figure 2. The reset port allows sending a control signal that resets the adaptive filter coefficient to zero. Note that all tests shall be preceded by the reset action. The control allowing inhibiting adaptive filter operation is used in some tests (for example in Test No.10). NLP control is required for several tests of which Test No. 2 and Test No. 3 use it to largest extend. Some tests require NLP be turned off during the entire test procedure (for example Tests No. 4 through No. 7 as well as Test No.15 require NLP be disabled). Note that although it is not specifically highlighted by G.168-2012, in the case of a software-based echo canceller module, where inputs and outputs signals are represented by linearly quantized 16-bit data (with signal denotation typically used as follows: Rin, Rout, Sin and Sout), the G.168-compliance testing shall be performed using models representing real-life echo cancellation connectivity to the network. Therefore, interfaces PCM-A/m and A/m-PCM shall be a part of the software test bench under which G.168-compliance testing is performed via numerical simulation. VOCAL’s LEC/NEC software solutions are designed to pass G.168-2012 requirements using any echo path models defined by G.168-2012 as well as customer models, provide they fit to the echo path coverage of the echo canceller using a G.168-compliant software test bench.